Give the gift of an elegant, lacy, immortal hand-crafted rose with a pretty hand-stamped card that is easy and fun to create! 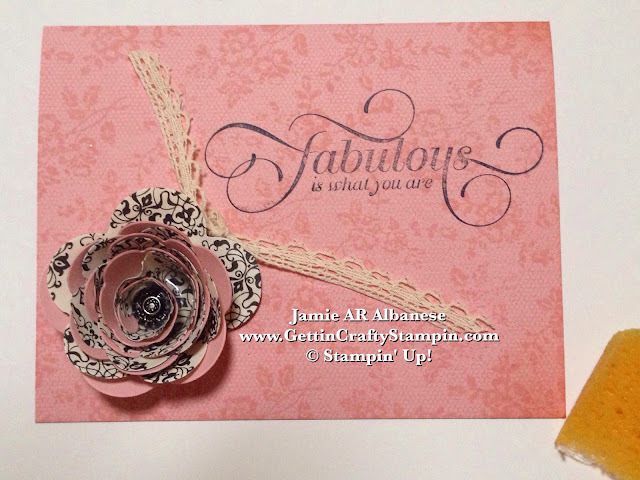 I am not super girly but creating a card that is ultra feminine is a fun way to step out of my comfort zone. With coordinating stamps, tools, papers, accessories, ribbons and inks you can quickly create a hand-stamped card that will make them stop and enjoy the roses! I Love the look of tone on tone. Our stunning top-quality colors come in coordinating and matching colors so that you can create many looks. 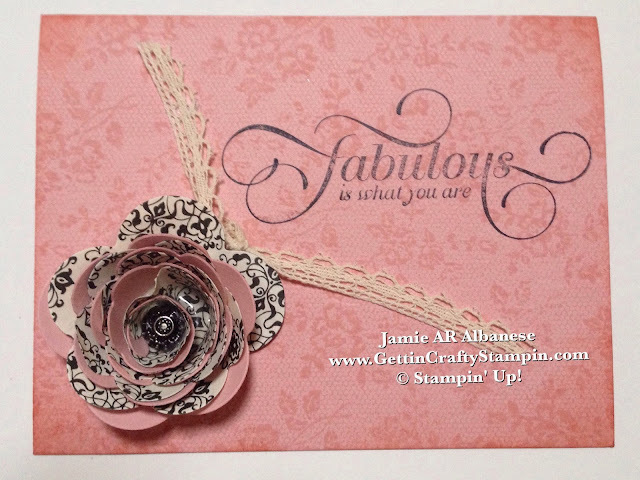 Here stamping the I Love Lace background stamp with the Blushing Bride ink on the Blushing Bride card stock creates a tone on tone look that is elegant and subtle, making for a vintage vibe. Take the vintage feel up when you distress the edges. 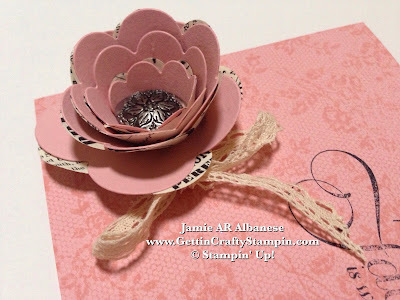 Simply age it and soften it with the Stampin' Sponges in the Blushing Bride ink pad. Rub the ink along the edges, more in the corners (like on the right side of the card, above) for a softer, subtle accent that with tone-on-tone will add age to this card. 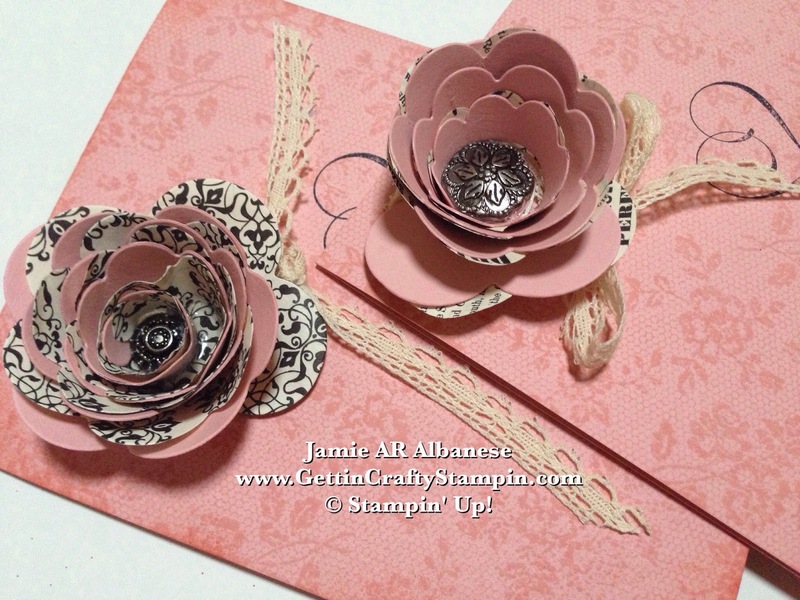 Create these stunning 3D roses to accent your hand-stamped cards, gift bags, tags, and more using our Big Shot Die-Cutting Machine and the Spiral Flower Die. Laying both the Typset Spiral flower over the Blushing Bride one. I like to use my Bone Folder (102300) like on ribbon and pull it softly to make the shape curl. Punch a whole in the base piece with the 1/8" Circle Handheld punch and add the Antique brad of your choice. Roll the flowers together and add hot glue to the base around the Antique Brad to hold the rose together. Adhere it to the card front with the hot glue for an extra strong hold. Tie on some fun... using the Venetian Lace Crochet Trim and tie on this pretty accent. You can either lay it out on the card or tie it into a bow... both are lovely. I love how they accent the Million & One sentiment in the Jet Black Stazon ink on this card. Hand-stamped cards are a gift that keeps on giving, they live on to leave a lasting hand-written note of cheer while being more lovely, because it was made with love. 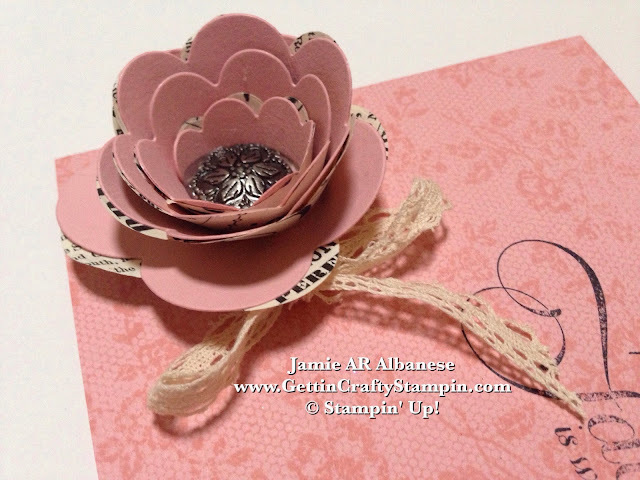 Here a hand-stamped card with vintage lace, stunning hand-crafted paper roses (that will never die!!) and a sentiment that is sure to brighten someone's day is a gift that will live on for years to come. I hope that it inspires you to hand-create a wish that will live on and leave a legacy of love.